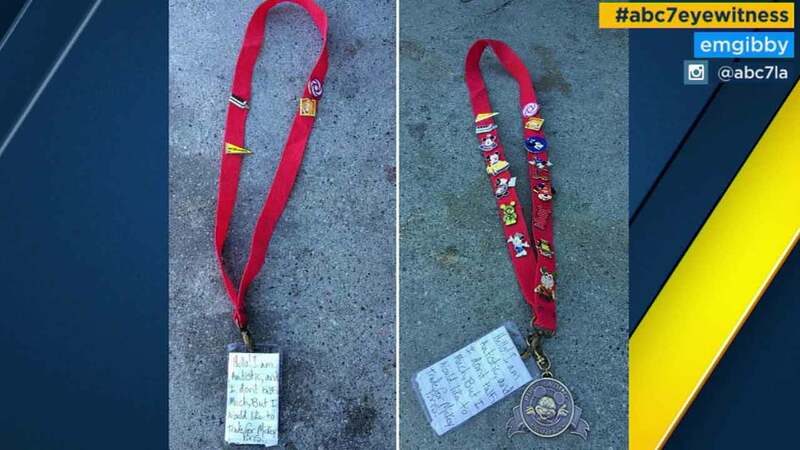 A Disneyland employee posts the picture of a Disney lanyard she found and added 11 pins as she searched for the owner on Saturday, April 1, 2016. ANAHEIM, Calif. -- Disneyland workers are looking for the owner of a lost lanyard that may belong to a person with autism. Park employee Emily Gibby found the lanyard on Thursday. She said it had a note that read, "Hello, I am autistic and I don't talk much, but I would like to trade for Mickey pins." The lanyard had a couple of pins attached to it but Gibby added 11 more and posted a picture on Facebook. The picture has been shared more than 10,000 times on social media. Eyewitness News wants to thank Gibby for sending us the picture using #ABC7Eyewitness. If you want to claim the lanyard, call Disneyland's lost and found.